Headlines: Fishing reports have been good again this week. 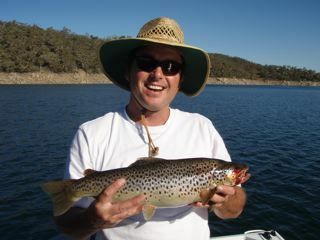 The lakes have provided the most reports and Eucumbene has produced yet again with some excellent baitfishing with Mudeyes and the fly fishing and trolling has been outstanding. Jindabyne has also fired over the weekend with some great trolling. * John Hyland and Warren Sharpe had a night session at Seven Gates with Warren hooking two but landing only one, a Rainbow. John hooked and lost a good one. Mrs Simpson's worked the best. 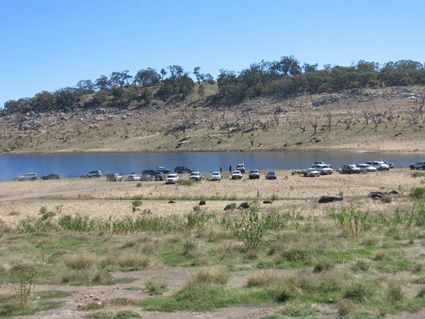 Lake Jindabyne:- Reports from Jindabyne have been few and far between though a coupleof anglers did report seeing a few fish cruising close during the early morning. With a nice still calm day polaroiding is a great option. With cooler nights the edges should fish well early in the day and again during the evening. Small wets and searching with Woolly Buggers will find a few fish. A Mudeye pattern after dark in the evenings should turn up a few good fish also. 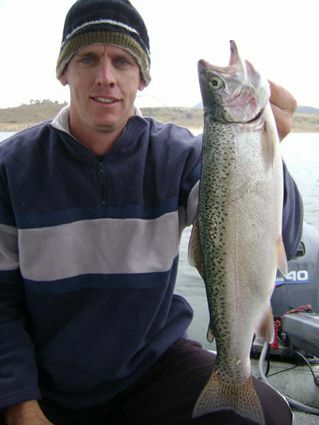 *John Hyland and Warren Sharpe fished Jindabyne with Warren catching a Rainbow just under a kilo. 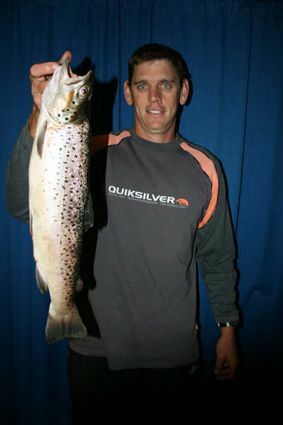 *Rod Woodward fished as part of a Vikings Fishing club weekend and caught a great 57cm Brown on a #48 Tassie Devil. Top fish. 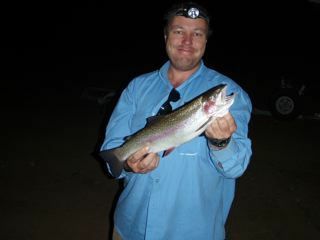 *Ross and Ange from Queanbeyan trolled Rapala's for nine nice fish a mixture of Browns and Rainbows. at the boat near wast point on the down rigger. 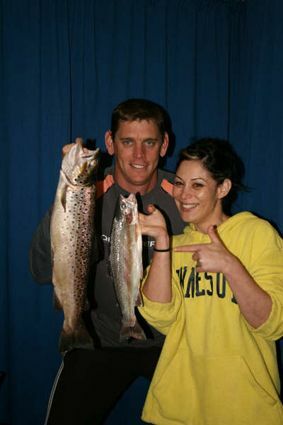 *Mick Fisher and Clayton McCormack from Orange had a pretty good trip recently. Between them they caught eleven fish in the Thredbo river on Vibrax spinners and then six between them on the troll in the lake. Black Tassies, 5cm Rapala's and Storm wild eye minnows were the best lures trolled on Leadcore. The Snowy arm was the most produtive area for them. Just thought I'd send you a report from Jindabyne over the Easter long weekend. Sara, our one month old son Lochie, Ana and Sole (who have never been to the snowies) and myself headed down on Thursday arvo thanks to the boss giving us an early knock. This would also give us the opportunity to fish Friday morning. We arrived that night just in time for the cold change, which was great for us fisho's but not so great for the wake boarders who were hoping for a weekend of sunshine. We came to the decision that I would take the new recruits out in the morning whilst Sara and Lochie slept in (to keep the little fella out of the cold ... nice excuse Sara). Our plan was to fish around the Snowline Holiday Park and it only took a few minutes to show the others how to bring in a nice sized rainbow trout. 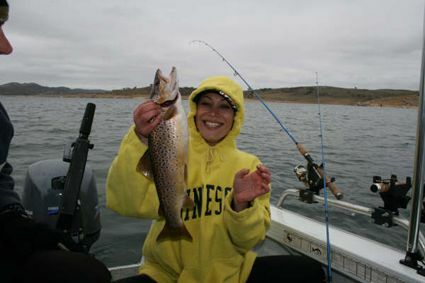 Soon after Ana was fighting her first trout and was over the moon when it hit the net. She was also excited that it was caught on a Pink Panther Tassie Devil, pink being her favourite colour. Soon Sole had his first in the boat and the bite was constant. The set up we ran with on the boat was two down riggers; one at between six and eight metres, and the other between 12 and 15 metres, as well as two flat lines. As the morning progressed so did the boat traffic and our next move was to troll from Hayshed Bay to Cooley Bay. Historically, we get fewer fish there but the fish are often of better quality; this was the case again with two 48cm rainbows and one 54cm brown. We finished the morning at 11 o'clock and had managed to drop four fish and land 11. You couldn't wipe the smiles off Ana and Sole's faces if you tried. The afternoon saw us hit the lake again, this time with Sara and Lochie and the plan was to have a 'friendly' boys vs girls competition with each fish measured and totalled at the end of the day. The girls had the first hit and after five lost fish it didn't seem that we would catch anything that afternoon until Ana hooked a nice rainbow about 200 metres from the Holiday Park. With tears of joy from the girls, as they thought they had just won the comp, I flicked the line from the down rigger clip to bring in the lines for the night. After two winds of the reel I was on to what felt like a solid fish. I gave Sole a high five and turned around to see the smiles wiped from the girls faces ... I had landed a 59cm brown, which weighed almost five pounds. This fish was caught on a Green and Gold Bumblebee Tassie Devil. What a way to finish the day! The next morning saw us on the water again with the same trolling pattern out. 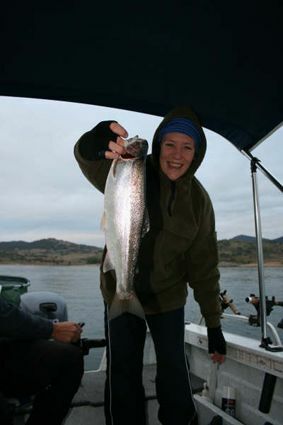 We fished between Lion Island and Snowline Holiday Park boating one nice rainbow. It seemed everyone had arrived Friday and decided to hit the water at once so we moved up to Waste Point and trolled for one nice brown and a couple of rainbows. From there we hit the Snowy Arm and due to the shallow water used flat line only, trolling a Pink Tassie Devil and Y48 Eucumbene Bomber. We got some nice rainbows with a total of nine fish for the morning. The girls won the comp with five fish to four (lucky we let them have the first fish!). We decided to give the arvo fish a miss and head into town for an early dinner. Our last morning saw us take the boat straight to Waste Point via road. The ramp was very shallow but we managed to get the boat in and once on the water, with the sun up high and clear sky, I thought this would be a day for the down riggers. After an hour with no joy, finally one of the down riggers popped and I landed a nice 52cm brown approx three pounds; this was caught on a Y05 Anglers Arty. We then headed up to the Snowy Arm, using flat lines only. There were a couple of fish dropped before Ana landed another rainbow. As we approached our turn around point (the yellow river markers) one of the flat lines hit so hard that the rod (which was on a 45 degree angel) touched the side of the boat and Sole fought and landed his biggest fish to date ... a 54cm brown in great condition. Boys two, girls one ... what sweet victory! Unfortunately it was time to head back to Sydney. Lures we caught fish on were no. 34 Green and Gold Bumblebee, no. 89 Rowleys Riot, Y05 Anglers Arty, Y48 Eucumbene Bomber, Y62 Yellow Fever, Y82 Canberra Killer and no. 55 Pink Panther (most successful). 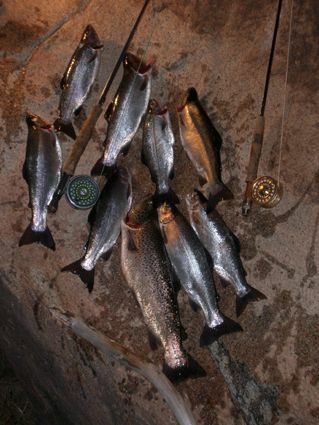 *Nicholas reports fishing the shore at Buckenderra on Sat night for five trout, all of which were very healthy looking fish, around the 38cm mark. Power bait was the best bait. *Graham Drayton and eleven year old Patrick Robinson have had a great session on the mudeyes this week. Fishing at Buckenderra between 1pm and 3.30 pm they landed seven quality Rainbows to 45cm. They nearly ran out of bait it was that good. They reported many anglers are not fishing at this time, with most waiting for the evening before venturing out. Obviously having a bait in the water rather than sitting back at camp is the way to catch some good fish at the moment.